Postpartum hair loss – the name for female hair loss after giving birth – is a condition that results from too many hairs remaining in the growth phase of the human hair cycle. There are three main stages in the sequence of human hair growth – the anagen, catagen and telogen phases. The anagen stage is the growing phase of a hair follicle – a period that lasts from 2-8 years – while the catagen phase is marked by roughly a two-week transitional phase in which the hair follicle shrivels in diameter and a club hair is formed. The telogen stage is the resting period. Greater levels of oestrogen in a woman’s body during pregnancy cause the hair to stay in the anagen (or growing) phase for a longer period of time, resulting in thicker hair. While the average person loses approximately 100 hairs per day, a pregnant woman can lose just half of that number and sometimes even less. The hairs that experienced a prolonged anagen stage fall out after pregnancy, due to the pronounced drop in oestrogen levels. Since the anagen hair follicles make up around 80-90% of the human head, there can be quite an extensive amount of hair loss – on occasions in clumps – which can cause some anxiety. However, postpartum hair loss should be seen as almost a resetting of the hormonal balance – a process of ‘getting back to normal’ – rather than something out of the ordinary. The hair should return to the same volume before pregnancy within 6-12 months. However, if the hair loss is still continuing by the child’s first birthday, it is advised to see a specialist. 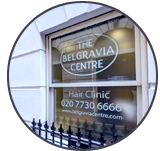 A specialist can also offer advice on whether hair loss may be too excessive and on potential related symptoms. The effects of postpartum hairloss can be limited through the use of certain techniques. A good diet will benefit the hair, while hair treatments should be carried out with more care. Shampoo only when necessary, while a wide-toothed comb can minimise hair tangling. Furthermore, it is advisable to avoid using blow-dryers and curling and flat irons until the postpartum hairloss subsides. The same applies to the use of chemically based treatments, such as highlights and straightening. A shorter hair cut may also work, especially for women with longer hair, who are perhaps more likely to notice and be additionally self-conscious of post-pregnancy hairloss. Stress and lifestyle changes and strains on the body – such as nutrient intake and thyroid and hormonal problems – are other features that can perpetuate the problem of postpartum hair loss, and these factors can possibly lead to a more prolonged condition called Diffuse Thinning. Repeated incidences of hair loss after pregnancy – which can result in less hair growing back each time – may cause a case of Diffuse Thinning. In these cases, it is advised to see a professional and undertake a detailed clinical history.